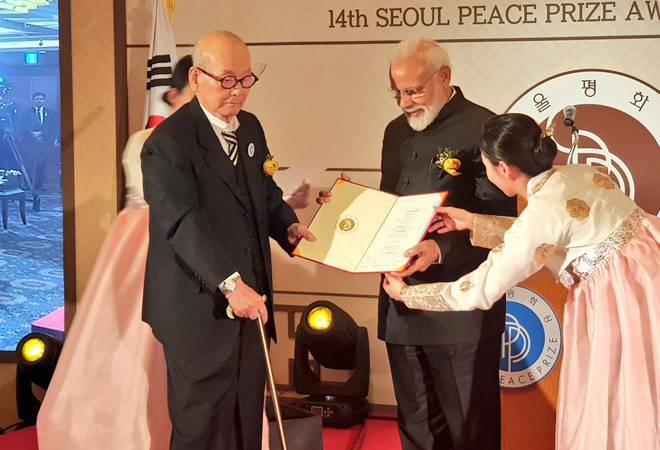 PM Modi receives Seoul Peace Prize: The prime minister was conferred the award for his efforts in promoting global peace and harmony. Prime Minister Narendra Modi who is in South Korea on a two-day visit, received the Seoul Peace Prize today. The prime minister was conferred the honour for his efforts in promoting global peace and harmony through inclusive economic growth and for improving quality of life, as mentioned by Raveesh Kumar, spokesperson for the Ministry of External Affairs. The Prime Minister accepted the award and dedicated it to the people of India. "This award does not belong to me personally but to the people of India, the success India has achieved in the last 5 years, powered by the skill of 1.3 billion people," he said in his acceptance speech. The Prime Minister was awarded the prize money of $200,000 that he contributed to the Namami Gange fund. Thanking for his award, the Prime Minister said that he was honoured that the award was conferred on him on the 150th birth anniversary of Mahatma Gandhi. On his first day of the trip yesterday, PM Modi had unveiled a bust of Mahatma Gandhi at the Yonsei University. The prime minister took the stage to turn the spotlight on terrorism. "A few weeks before the Seoul Olympics(1988), an organization called Al-Qaeda was formed. Today, radicalization and terrorism have become global and are the biggest threats to world peace and security," he said. Award dedicated to people of India. PM Modi added that the time has come to join hands and to eradicate terrorist networks, which is the only way to replace hate with harmony. The prime minister spoke about terrorism because of the recent attack on the CRPF convoy in Pulwama that had claimed at least 40 lives. "I would like quote a portion of the 1988 Olympics Theme Song, as it captures the hopeful spirit for a better tomorrow for all- 'Hand in hand, we stand, all across the land, we can make this world, a better place in which to live'," he said. Earlier in the day, the Prime Minister said that he had held talks with the South Korean President Moon Jae-in on enhancing bilateral cooperation in key areas including trade, investment, defence and security. The Prime Minister also met the First Lady Kim Jung-sook.